If you use an off-grid alternative energy system, you will need a battery bank with deep cycle batteries. The most common deep cycle batteries used in off-grid energy systems are (deep cycle) lead-acid batteries because they’re reliable, affordable, and able to repeatedly deeply discharge and recharge. But a lot is asked of deep cycle lead-acid batteries in off-grid energy systems. The regular deep discharging then recharging they have to perform puts a lot of stress on the batteries. But if you take proper care of the batteries …and also do a few tips and tricks we’ll teach you in this article, you can maximize the lifespan of your deep cycle batteries. We’ll also point out some of the most common mistakes we see people making when they use lead-acid deep cycle batteries in their off-grid energy system (so you don’t make the same mistakes)! One the most expensive parts of an off-grid energy system is the battery bank. And the batteries are typically one of the first things to fail in a system. Improper battery care often kills the batteries in the battery bank well before their time. This forces people to buy new expensive batteries and also cripples their off-grid system until they replace the dead batteries. So proper care is critically important so you prevent premature aging of your batteries and maximize their lifespan. And build your battery bank with those batteries instead of new pricey batteries. So this tip probably seems obvious, but the old adage ‘You get what you pay for’ holds true for most deep cycle batteries. Cheap off-brand batteries from China are flooding the market right now and you want to avoid using these. They generally have a much shorter lifespan compared to quality batteries that you pay a little more for upfront. High quality flat plate batteries can last between 10-12 years. The more expensive tubular plate batteries can even last as long as 20-25 years if maintained properly. Paying for higher quality batteries upfront that last 10-25 years may seem expensive but it actually ends up being more expensive to buy cheap batteries …then replacing them every couple years (because they die early). If you want to save money on your battery bank don’t buy “cheap” batteries, instead get quality used batteries and recondition them back to their original condition. Don't know what batteries to use? If you don't know what kind of batteries to get for your off-grid energy system, read our article about the 3 best batteries for off-grid energy systems. Even if you use the most expensive, high-quality batteries in your battery bank, it won’t be of much use if the batteries aren’t cared for and corrosion or acid is on them. Before you assemble all of the components of your battery bank, make sure to individually coat the terminals, wire lugs, nuts and bolts with a non-hardening sealant. You can also apply a thin coating of petroleum jelly to the battery terminals for some extra protection. Lastly, seal exposed wire at a terminal lug using submersible rubber splice tape or something similar. The reason all of this has to be done before assembly is because it ensures that all of the parts are equally protected. If you apply protective substances after you finish assembling the system, there is a good chance that dirt will get into small spaces that weren’t properly coated. If you’re using a solar panel or wind power system, you should make sure that your battery bank is big enough to carry six to ten days of load. You’ll always have a nice back-up supply of power. And you’ll also be able to use your batteries a little more gently so you don’t have to consistently drain them. At the very least, make sure to fully charge your batteries every 3 weeks. This reduces corrosion on the inside and ensures equalization. Because temperature extremes cause batteries to deteriorate much faster, it is important that you keep your batteries in a place where the temperature is relatively stable. Aside from enclosed above-ground structures, you can also create a structure that is partially underground. This way the temperature in the structure will remain the same no matter what the weather is like outside. In addition, make sure that the charge controller or inverter system has a built in temperature compensation feature. This is necessary because the charge voltage limit of a battery increases as temperature drops and decreases at temperatures increase. Ideally, your battery bank should only be made up of a single series of cells. The more cells that are included, the higher the chance of there being random defects. There’s also a greater chance of losing equalization, resulting in cells failing prematurely. If you can’t stick to just a single series of cells in your battery bank, limit it to three parallel battery strings. A renewable energy system monitor will help you keep track of the performance of your system (including the battery bank). It will also help you troubleshoot any issue that comes up with your system so you can troubleshoot it before it turns into a bigger problem. This will be particularly important if you are relying on the power from your off-grid power system and living in a remote area. It will also help you maintain your batteries so you don’t have any surprise repairs that are costly and could have been avoided. 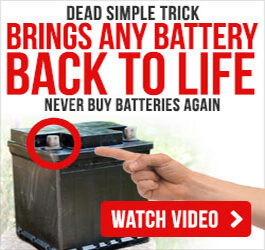 What else can you do to make your lead-acid deep cycle batteries last longer? There are additional ways you can extend the life of your deep cycle lead-acid batteries. 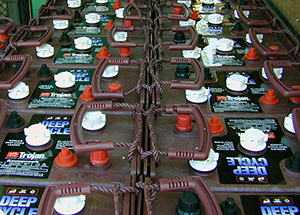 We cover all of these methods in the EZ Battery Reconditioning Program. 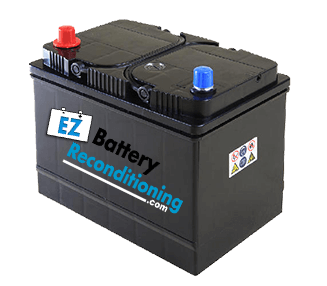 Additionally, you can also bring old or dead lead-acid deep cycle batteries back to life again with the EZ Battery Reconditioning program. This will allow you to give your old batteries a “2nd life” so you don’t have to buy new pricey batteries for your battery bank. Or you can even build an entire battery bank with used batteries that can get for free (or dirt cheap), that you recondition with our system. Awesome! Much appreciated! Keep the good information coming! Really helpful report. Thank you. I enjoyed your explanation on maintenance of batteries. Great info. I live in Florida with well water so I am setting up a small battery string to turn my well pump on when the electricity goes out like it did for 5 days last year. My car battery guy recommended golf cart batteries but I wasn’t sure, now I am. Thanks. Hi Tom, that’s a great idea! Especially if another hurricane rolls through again (like the big one that hit Florida last year).